Over the last few weeks, a small town in Canada has lived in fear of exploding whales. At the end of April, a dead blue whale washed up on the shore of Trout River, Newfoundland. Amid concerns it could be a shipping hazard if dragged out to see, locals were forced to leave the whale decomposing on the beach whilst local and federal authorities argued over who should deal with the remains. The carcass then proceeded to expand to about twice its normal size due to bloating from methane gas, a normal by-product of decomposition. Unfortunately, there is only so far a bloated blue whale can stretch, leaving local residents on stand-by for a pretty big bang. Strange as it sounds this is a legitimate concern – last year a washed up sperm whale in the Faroe Islands exploded as a biologist attempted to dissect it (warning: video not for the faint-hearted). Eventually, a team from the Royal Ontario Museum headed over to dismantle and remove the blue whale – a feat which took them almost a week. Whale carcasses aren’t that great in general, regardless of their explosive potential. A few years ago in Scotland, I took my sister to see a washed up sperm whale at our local beach. We arrived at the car park and started walking. When we were 1km away, she sniffed a few times and asked “What’s that smell?”. It only got worse. 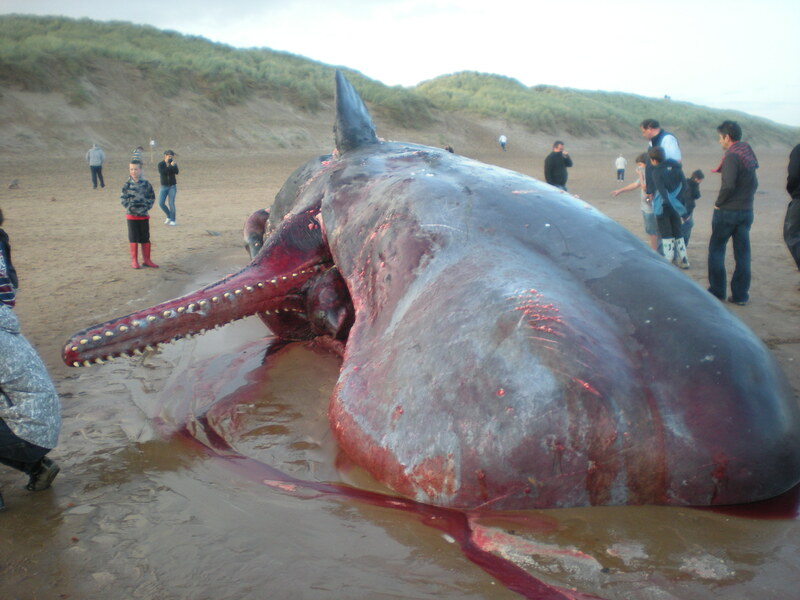 Dead sperm whale – winner of Aberdeen’s Top Tourism Attraction 2009. But despite this, hundreds of people came to see it. The carpark was overflowing for days whilst people made the trek to see the spectacle because, dead or alive, it’s just not every day you see a sperm whale. People brought their kids (who poked it), dogs (who rolled in it), and cameras to remember the experience. So, given the high number of marine mammals out there, why aren’t we constantly assaulted by the stink of washed-up whales? When they’re not washing up on our beaches and becoming a gruesome attraction, what happens to the remains of whales and other marine life? The answer: Whale Fall. Deep-sea zones are pretty special when it comes to food-chains. A lack of light means no plant life, which is generally the foundation of most food webs. Instead, the deep sea ecosystem consists mostly of scavengers, who are fed from above by a constant drizzle of organic particles and detritus known as ‘marine snow’. But every so often, a really big particle falls in the form of a whale. And when this happens, the whole community turns up for a feast. Recently, a deep-sea graveyard was discovered off the coast of Angola by remotely-operated vehicles (ROVs) conducting oil and gas exploration. Consisting of a dead whale shark and four rays, this represented a surprisingly high concentration of deceased megafauna over a relativley small area. Scientists are now using this footage to compare the species composition of scavengers on the shark and ray carcasses to the scavenger species present on whale falls. Ecosystems within ecosystems. A pretty cool example of how life goes on! This entry was posted in Research, Whales and Dolphins and tagged Biology, Blue whales, Deep sea, Marine biology, Nature, Research, Science, Sperm whales on June 5, 2014 by Sarah Marley.